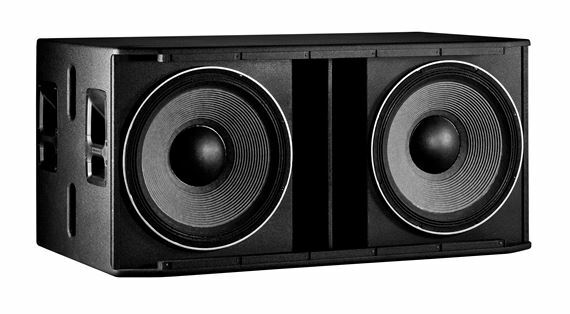 Exclusive 12, 8, 5 or 3 Easy Payments on JBL SRX828SP Dual 18 Inch 2000 Watt Powered Subwoofer only at AMS! Free 2 Day Shipping & Free Extended Warranty. Call our Gear Experts at 800-319-9043 for expert advice! The JBL SRX828SP - a groundbreaking powered subwoofer! There are few companies in the pro audio universe that enjoy the reputation of JBL. With over seven decades of loudspeaker expertise, JBL continues to release products that are as impressive as they are groundbreaking, or in this case, ground-shaking. 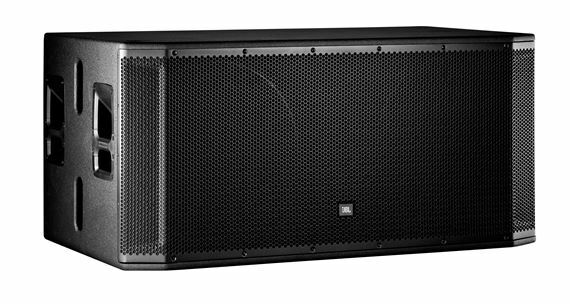 Perfectly suited for a variety of uses, this dual 18" sub is at home in a live performance rig, mobile DJ system, or permanent installation. Built with functionally designed handles and a comfort grip for efficient handling alongside a rugged construction ready for the road, the SRX828SP is the perfect solution for any situation where immense low end is required. Shouldn’t All Subs Have These Features? The SRX828SP is chock-full of super useful features that you'll soon wonder how you ever lived without, namely the full suite of user-configurable SHARC® Digital Signal Processors. For starters there are 20 Parametric EQ's, more than enough to subdue the most resonant frequencies in any sonically challenged room. There are 2 seconds of available delay, allowing you to time-align your system to perfection while the onboard signal generator (pink noise, white noise, sine wave) makes tuning the room a snap. Additionally, 96kHZ FIR filters, LevelMax™ limiting, input mixing, amplifier monitoring, and 50 User Presets offer you unprecedented control of the low frequency spectrum. 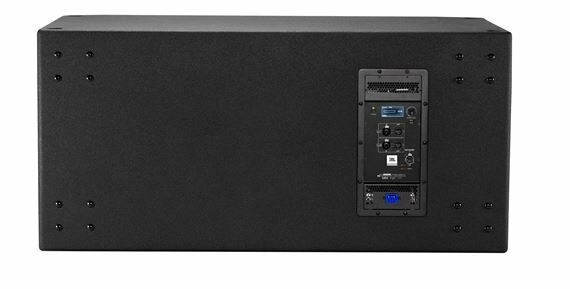 There are even V5 tunings for compatibility with JBL's flagship Vertec and VTX touring systems and it can all be controlled with Studio Architect or the newly developed stand-alone SRX Connect mobile app. For the new SRX 800 Series, JBL challenged their global team of engineers to design the very best transducer possible at this price point and they actually exceeded expectations. Loaded with (2) Differential Drive® Technology speakers, the SRX828SP benefits from reduced weight due to the low mass ferrite magnets with increased power handling. This is thanks to a massive 3” voice coil, virtually unheard of at this price, while adhering to JBL’s exacting standards for frequency response and distortion. With a frequency range from 150Hz, dipping way down to 29Hz, and a max SPL of 141dB, the SRX828SP is the epitome of range and power. Serious speakers deserve serious power and JBL certainly didn’t skimp here. In fact, the SRX828SP’s 2000-watt Class-D amplifier is the most powerful in its class. Powered by Crown proprietary front-end DriveCore technology, the low distortion, high sound pressure levels and extreme clarity are all achieved with an astounding 103dB signal-to-noise ratio. Subjected to JBL’s vigorous 100-hour power test, the DriveCore amplifier delivers incredible punch with renowned JBL reliability. The SRX828SP’s rugged, 18mm wooden enclosure (the thickest and most robust available at this price point) is coated in Duraplex for a lifetime of protection, while the 14-gauge grille securely protects the components. Smart appointments include indexed feet to minimize vibrations when cabinets are stacked and glow-in-the-dark ink to make everything easily visible on a dark stage. Enjoy quick and easy setup configuring your system via full HiQnet Network Integration with the fully automated control interface. An Ethercon connector allows for wired connections, while third party wireless router capability allows control from Audio Architect, HiQnet Motion Control™, or iOS® and Android mobile apps. 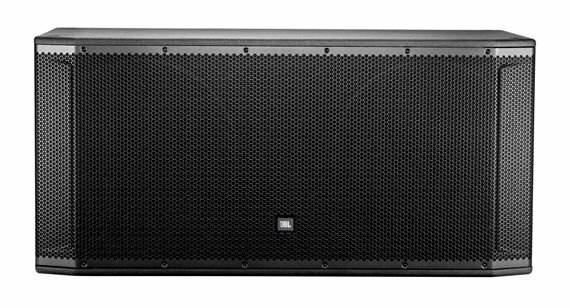 The JBL SRX828SP is tailor-made to be the lower-end foundation of a live sound rig, so make sure this centerpiece is protected from dirt, dust, the elements, and the regular wear that occurs during transport and storage. The JBL Bags SRX828SPCVRDLX Padded Cover (sold separately) is water-resistant, made of heavy-duty black nylon, and features a 2.5mm polyethylene grille protector to go with 10mm of padding. Adorned with the stylish JBL logo and designed with exterior Velcro handle covers for easy transport access, this padded cover is a must-have for this JBL sub! Only the best for my dj servicenow my set up is complete with 4 duel 18s powered there light and easy too install thank u AMS !! Awesome punch love it gives your venue that clean sound bottoms buy theses. 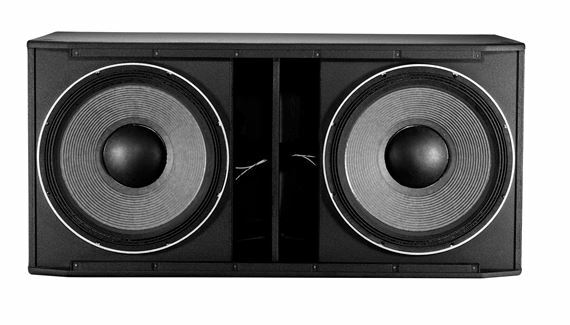 Best Dual Subwoofer on the market! It’s an amazing subwoofer and it brings the quality sound that my band needs. I suggest you get one as well and I promised you will not be disappointed! Product was excellent. It was beyond expwctation. Excellent customer service . Fast as well. I highly recommend this site for everyone. Just the Sub I wanted it to be. Heart-pounding Deep bass with Thump and Clarity! !